There’s no doubting the band’s loyalty to all things retro, as ‘The Bright Side’ opens with a melody that tips the hat to ‘Strawberry Fields Forever’ before a loud, slightly nasal vocal drops against a heavy drum loop that borrows heavily from ‘Tomorrow Never Knows’. The Beatles love is large…and perhaps love is all you need. More than that, though, The Bloakes introduce some superb 70s inflected keyboard work and heavier sounds via distorted and reverbed guitars to ensure this isn’t just simple recycling. Those guitars, in particular, pierce through the haziness with a frightening clarity, while the vocal eventually settles upon a reasonable hook. Adding everything up, it’s got elements from across the decades, each one beautifully arranged for a dark and slightly paranoiac feel. Tapping into something with more of a funky groove, ‘For a Bitter End’ settles somewhere between the lesser sounds of the 90s baggy movement and The Stone Roses’ classic ‘Fools Gold’. With a constantly dancing bass, the track constantly moves forward, while more Hammond swirls hammer home some constant 60s obsessions. The marriage of the two styles results in an arrangement that borders on the faultless, showing the band to be very tight within their hazy musical framework. Vocally, too, there’s a natural flair that compliments the music rather than stifling the effervescent bounciness. Also, those with a keener ear might even stumble upon the odd harmonic moment that’s reminiscent of the much missed Cardigans – not necessarily something you’d expect after the opening track, but there it is; it must be something in the Scandinavian make-up. A clear standout, ‘Anomie’ brings the mood down to a more thoughtful mid-pace, stoking up the organ sounds and slow rhythm guitar, before topping everything with a maudlin voice. The slow chord progression and harmony vocals work together to leave an indelible sound, before lifting into a brief chorus that suggests power but without dominance. 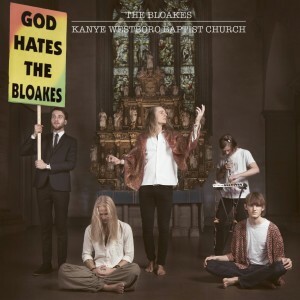 Like a more modern reworking of ‘Time’ by Pink Floyd, The Bloakes demonstrate a clear understanding of how emotive atmospheres can be built without ever resorting to lengthy instrumental passages to do so. The power is all in the song itself. The psych vibe still cuts through the centre, like red letters through a stick of rock, but the leaning towards other elements of prog rock might be just enough to catch the ears of fans of the style, particularly those keen on fellow Scandinavians Airbag. ‘Tell Your Children’ shifts everything back towards the 90s, bringing a tune that has droning elements alongside some great bass work, like a more sedate, indie rock retelling of The Chemical Brothers ‘Setting Sun’, before exploding into a repetitive and harmonious hook. Musically, it evokes images of festival time, of floppy hats and sunshine, and by the time it reaches its peak, with sharp piano lines weaving between heavy reverbed guitar, there’s a feeling that this has been very cool. Although bearing a passing resemblance, The Charlatans couldn’t have come up with anything this good if you locked them in a recording studio for three weeks. Settling for second best track, ‘Moscow Ages’ hits hard with yet another Beatles-y drum loop and at this point, a band with a lesser talent could appear to be going through the motions, but The Bloakes make it just different enough to stand on its own. The lead guitar parts are fuzzier than ever – indeed, a lead break is so distorted, it’s hard to work out if it’s a guitar or keyboard – and introducing accompaniment that resembles sitars is a master stroke. Or it would be, if not for the unexpected coda where the band embarks on a total freakout that pulls influence from Floyd’s ‘Interstellar Overdrive’ crossed with Traffic’s ‘Pearly Queen’. As always, if you’re going to be inspired in such obvious ways, it helps if you’ve borrowed from the very best. This is genuinely excellent – five tracks drowned in a druggy haze, often sounding as if Bobby Gillespie had discovered the first Procol Harum record and reworked bits of it to fit an obvious obsession with The Beatles’ ‘Tomorrow Never Knows’. There’s not always the hugest variety within the material, but there doesn’t need to be. Everything here just works and the production values are terrific. Hear it at the earliest opportunity…there’s little doubt that it represents almost everything you’d want from underground psychedelic revivalism. Few releases are worthy of being labelled an instant classic, but this EP could well achieve such a distinction. This entry was posted in Album & EP Reviews and tagged psychedelia, retro, rock, sweden, underground classic by Real Gone. Bookmark the permalink.